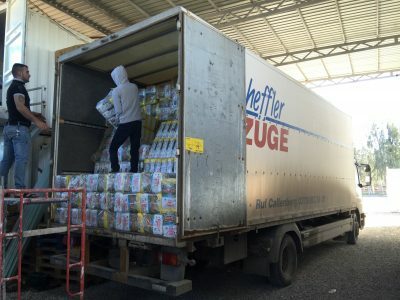 Diapers for Refugees has been committed to serving the Christian victims of radical Islam since 2016. 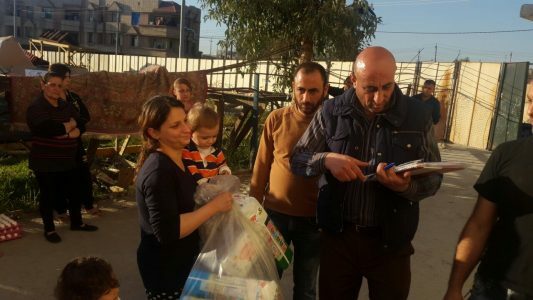 To understand the influence your support has made through this program, please read this story from an 86-year-old man with paralyzed legs who receives adult diapers from our Diapers for Refugees program. Adult diapers allow this paralyzed man to sleep normally at night. 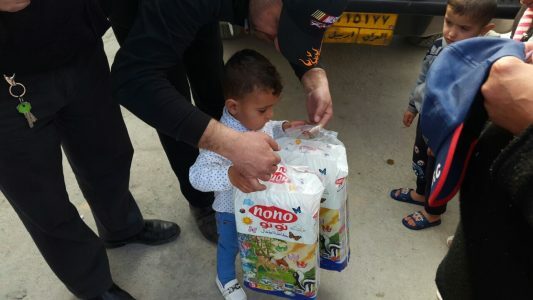 “I love to state my gratitude for your help, I want to ask you to keep providing this kind of help, because I can’t afford the diapers for myself due to my disability and illness. 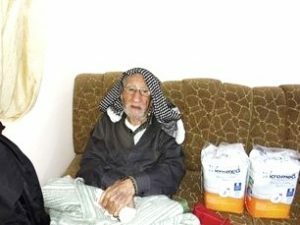 I am aged patient, but with the diapers I can sleep properly in my home with a proper life. I am satisfied with what God done for me that He made me be able to return back to my hometown when the Daesh (ISIS) were defeated. I believe that God didn’t forget me. 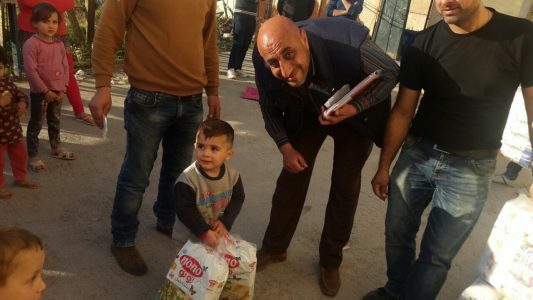 The man, who we will call Matthew, was helped to escape as the Islamic State overran the Nineveh Plain. 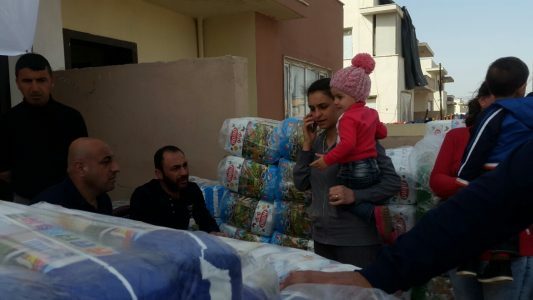 He was cared for in a camp for displaced persons in Erbil but insisted on returning to his native town of Qaraqosh. 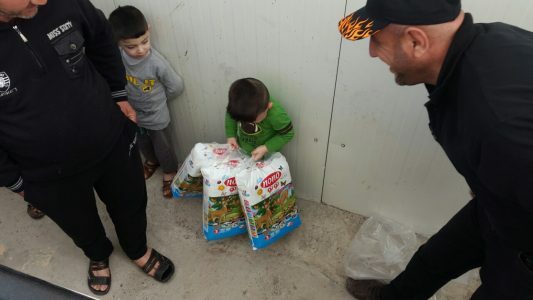 Many have returned with him to ancestral homes on the Nineveh Plain including young families who now have babies and toddlers. They are returning to looted and destroyed homes. This ministry is blessed to have the opportunity to make a very real impact on Christians who have suffered loss and humiliation. 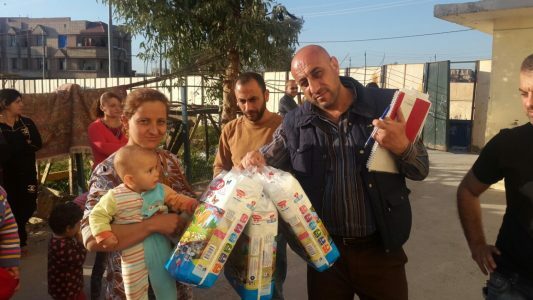 You see, the Religious Freedom Coalition provides diapers every month, not just to disabled elderly, but directly to 1,080 babies and toddlers of Christian mothers in the Nineveh Plain area of Iraq. This note from the mother of four-month-old Jeenil Waad Moses from Bartilla encourages us to work to do even more. 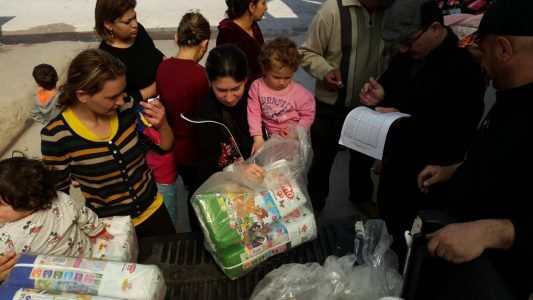 More than 1,000 displaced Christian mothers receive diapers for their babies and toddlers. 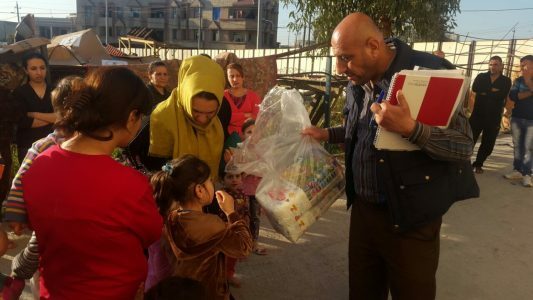 “I have been recieved diapers for three times, one time monthly… I was not able to buy diapers for my daughter since the day of her birth. I was very happy once I saw your team members and I felt that God didn’t forget us even though our house is destroyed and we do not even have a bed to sleep on. 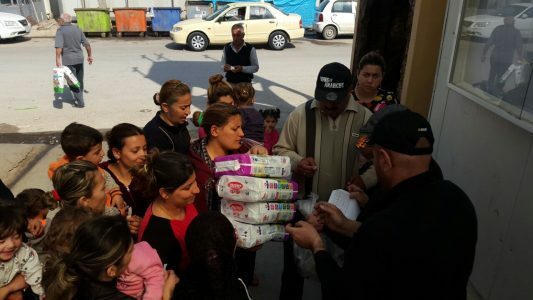 By supplying these mothers and babies with diapers, we are strengthening their faith in Christ and proving that they can trust in God to provide for their babies’ needs! 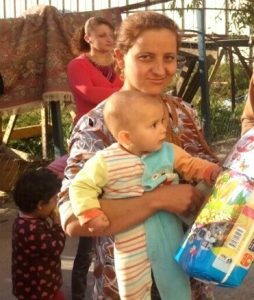 The joy this program provides for these displaced Christian mothers is evident in their smiles. 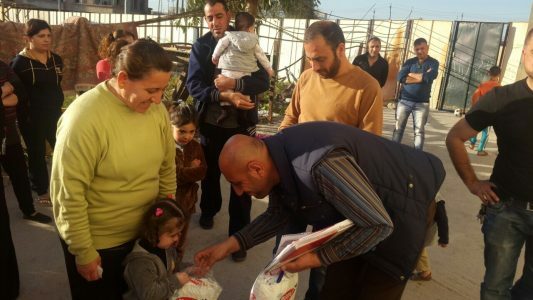 To show your support to this growing program and to do your part to come alongside our brothers and sisters in need, please help by donating today! 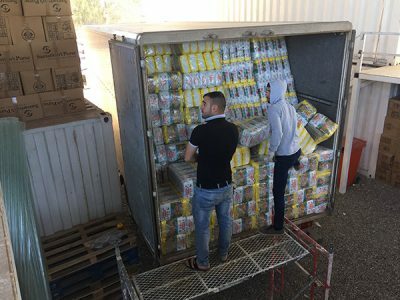 Two million diapers in 2019: More help is needed for Christian families on the Biblically important Nineveh Plain — not less. 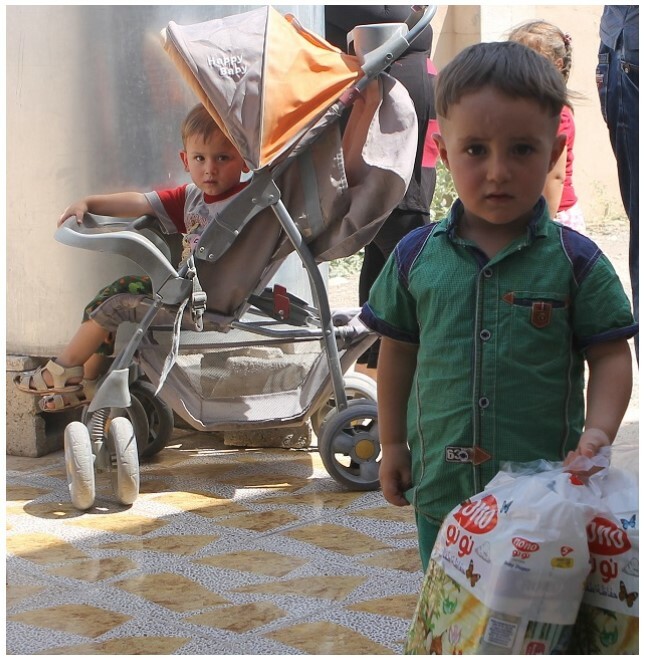 There is no running water in many of the Christian towns on the Nineveh Plain. 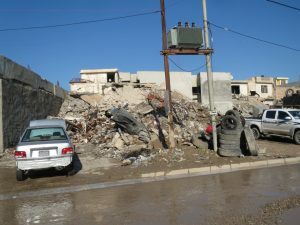 Two full years after liberation, areas of Qaraqosh still look like this. Note that the power lines actually are not connected to anything. Their water came from the dam on the Tigris river near the major Iraqi city of Mosul. That was the largest Iraqi city held by the Islamic State and it took more than a year for the Iraqi Army and Shia militias to take the city back from the Sunni jihadists of the Islamic State even with nearly constant bombing by The United States and other Western air forces. The electric power plants were destroyed in the bombing. The water treatment plants were destroyed in the bombing. The water pumping stations were destroyed in the bombings. Most of the power lines came down and the water pipelines were hit as well. When I was in Iraq this past December, there were still craters in roads. While many of the bridges that were bombed by the Western Coalition to stop Islamic State movements have been rebuilt, there are still some bridges that are down making transporting water difficult. It gets worse: As I have mentioned previously in newsletters the water from wells on the Nineveh Plain is as salty as the sea. The well water is not drinkable. Cloth diapers cannot be washed in well water as the salt will stay in the diapers and irritate babies, causing diaper rash. 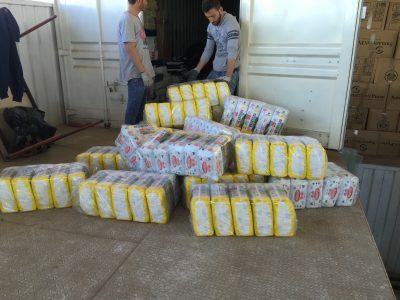 The whole purpose of our Diapers for Refugees program is to reduce or stop completely the problem of severe diaper rash that can cause bacterial infections. 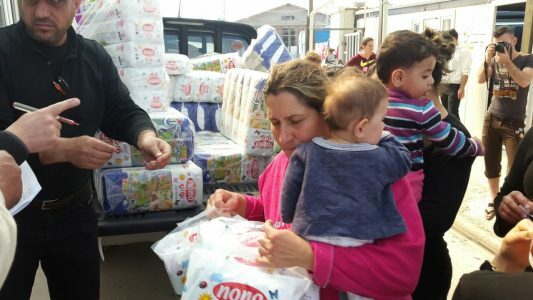 During 2018 the need for diapers increased as families moved away from aid centers and tried to move back to their looted homes. 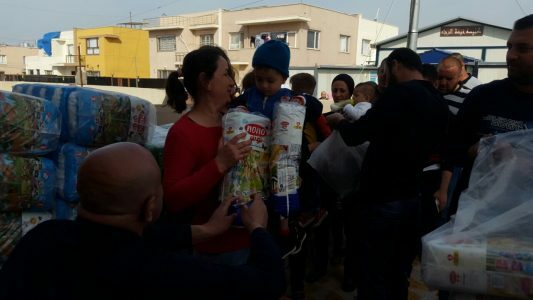 As more families move back to Bartella, Qaraqosh, and other towns on the Nineveh Plain they receive less aid than they could have gotten in the larger city of Erbil. Keep in mind that every Christian home was looted. The washing machines are gone as are the stoves, air conditioners, furniture and even the clothes and dishes. Because of the images many Americans have of those living in the Middle East, I have to emphasize over and over again that these Christian families were almost all well educated and middle class. The Christian families did not live in tents or huts, like the image many have set in their minds. Many of these homes were anywhere from 1,500 to 4,000 sq. ft. and had tiled floors with full modern baths and kitchens. That is all gone, every bit of it. I have been in these homes … before and after. 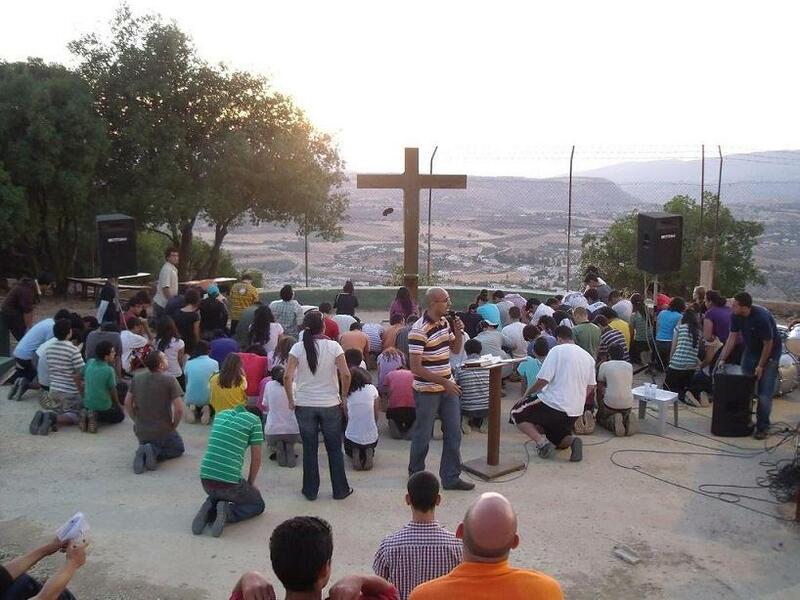 I have enjoyed dinner in more than one Christian Arab home in the Middle East. I have met Christian men and women who are doctors, lawyers, and businessmen. Some were millionaires before the invasion. I have also seen the jihadist writings on the walls of destroyed homes. I have visited the shops and even factories that were owned by Christians that now lie empty or in ruins. There was a huge metal door and window factory at the entrance to Qaraqosh that now lies in ruins. 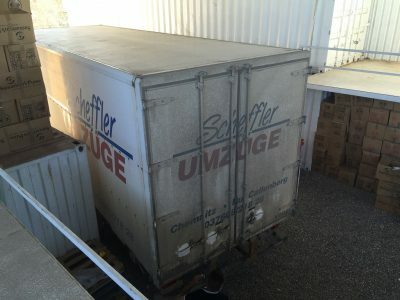 All of the equipment was stolen and carted off to Turkey. Currently the biggest industry in Iraq is demolition and the reprocessing of scrap metal and cement. Those are not great paying jobs. And sadly, I must report that most of the wealthy Christians, those that were millionaires fled to Europe during the occupation by the Islamic State. They don’t plan on coming back. Without the wealthy the rebuilding process will be even slower. 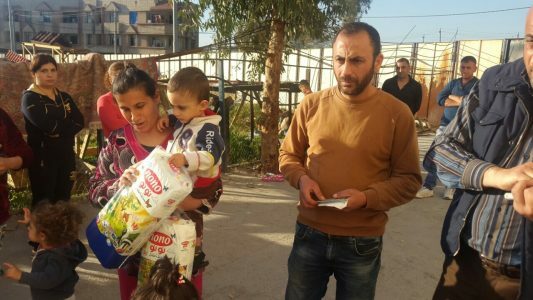 Every dollar counts in a situation like this: This is why the Diapers for Refugees program is so important. 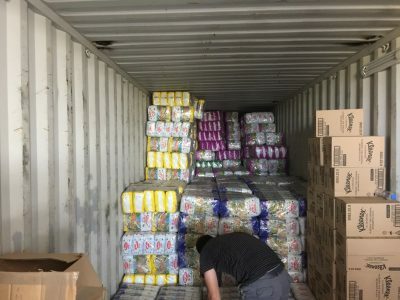 Every dollar’s worth of diapers we can furnish to families in need is one more dollar they have to rebuild their shattered lives, one more dollar to help buy dishes or linens or a mattress to sleep on. 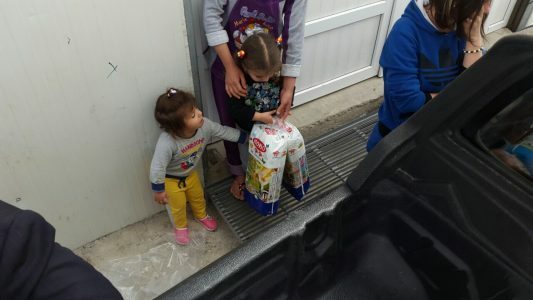 These are the reasons I want to keep the Diapers for Refugees program alive in 2019. 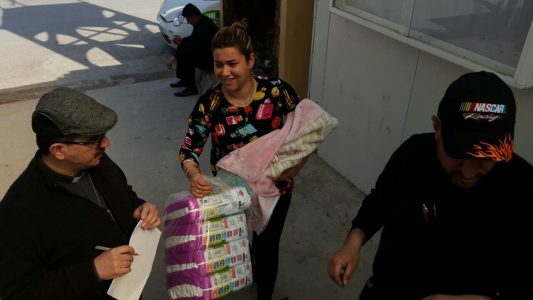 The supporters of the Religious Freedom Coalition propelled the Diapers for Refugees project to a record number of Christian families in Iraq and Jordan. 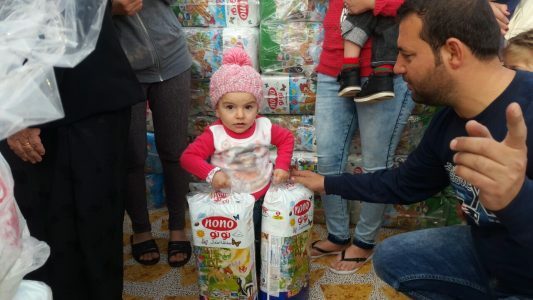 In all, over one million diapers were delivered to Christian families in need during 2018. 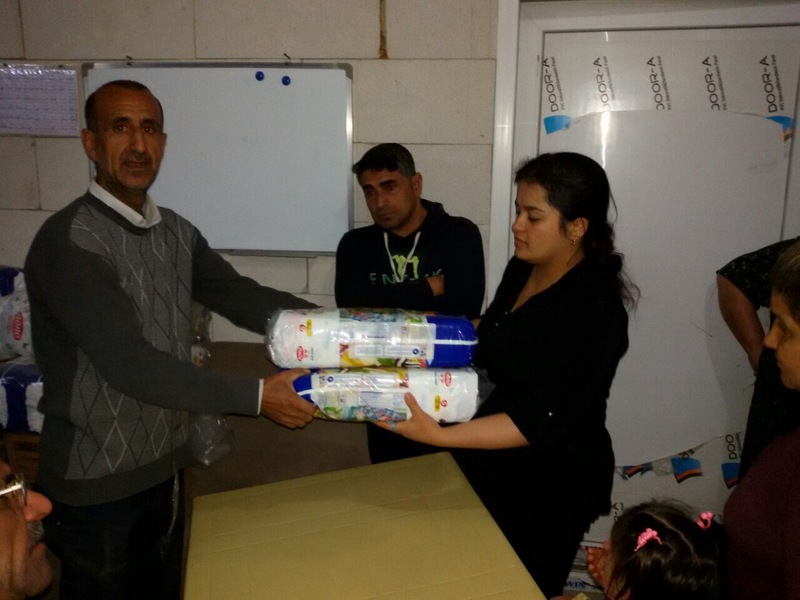 All of the families helped were in situations where cloth diapers for babies could not be used. 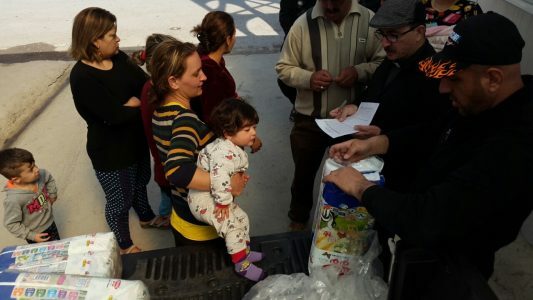 All of the families faced economic situations caused by the destruction of there homes in Iraq and Syria by various Islamic jihad fighters, including those from the Islamic State. While the Islamic State did a great deal of damage and killed tens of thousands, the jihad fighters of other groups including al-Nusra killed and destroyed as well. Al-Nusra is currently known as Jabbat Fetah al-Sham, but the first name it used was al-Qaeda in the Levant. Yes! This is a branch of the organization that attacked the United States on 9-11. This is the organization founded by Osama bin Laden. It is also the main group fighting to overthrow the secular government of Syria. When the United States armed the “opposition” in Syria, all the funds and missiles wound up in the hands of al-Qaeda. 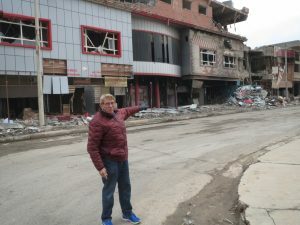 William Murray in Qaraqosh just after it was liberated in 2016. No civilians had moved back. 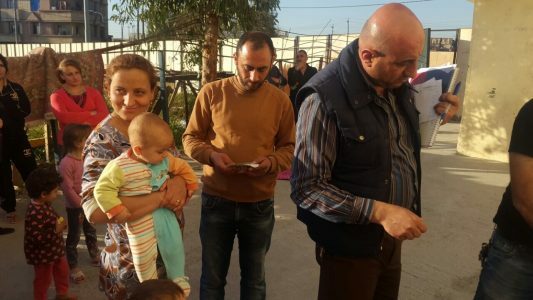 Situation no better: I first visited the Christian town of Qaraqosh, Iraq in December 2016 just three months after it was liberated and before one single resident moved back. While I was there I could here the artillery fire from the front lines outside of Mosul, the largest city that the Islamic State occupied. At the time I led a caravan that took food and water to members of the Christian militia know as the Nineveh Protection Unit. They, along with a Shia Muslim militia, had liberated the town from the hands of the Sunni Muslim jihadists. I know we are told by our government officials every day that the Sunni Muslims are our allies, but sadly this is a lie. Al-Qaeda and the Islamic State (ISIS) were Sunni Muslim, and both at one time or another have been funded by the Sunni Muslim state of Saudi Arabia. Every terror attack you can think of against Americans including 9-11 and the attacks at Ft. hood, San Bernardino, Orlando and others were all carried out by Sunni Muslims, and every one of the murderous perpetrators had some connections that led back to Saudi Arabia. 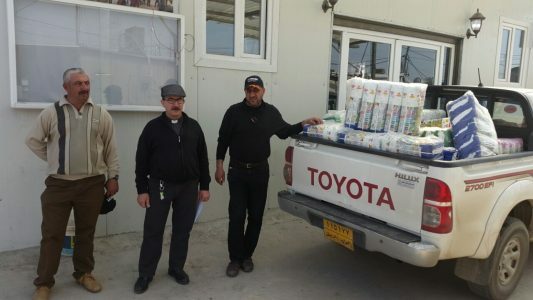 The Diaper Ministry: The Christians of the Nineveh Plain call us the “Diaper Ministry” and often tell our associates in Iraq what a blessing the gift of diapers is. I first visited the town of Qaraqosh shortly after it was liberated from the Islamic State (ISIS) in 2016. The battle for Mosul was still ongoing and the front line was close enough for me to hear artillery fire. 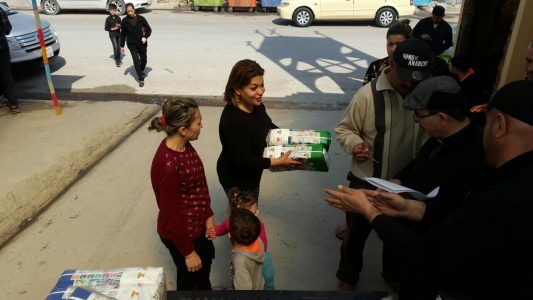 A Shia militia was using the Christian town as a staging area before moving to the front lines to fight along with the Iraqi Army against the Sunni Muslim Islamic State which still held Mosul. 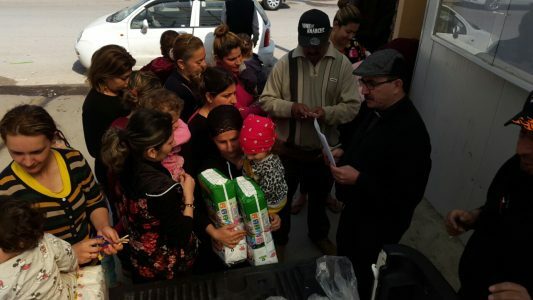 No civilians had returned, and the only Christians present were members of the Nineveh Plain Protection Unit (NPU) which is a Christian militia that fought with the Shia Muslims to liberate the area. 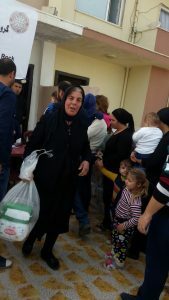 I met some of these Christians when I led a convoy of three trucks and vans to Qaraqosh to take food and water to the NPU, as they had been isolated by the Kurds. Our convoy was initially blocked by the Kurdish Peshmerga, who are viewed in the United States as the great heroes of Iraq. In reality, the Kurds were attempting to cut out a piece of Iraq for their own nation and wanted to take most of the Nineveh Plain for that purpose. 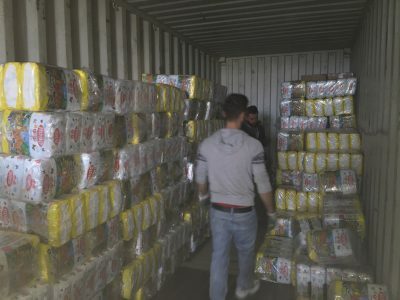 The Kurds are not America’s helpers in Iraq; they are helping themselves with American funds and arms. 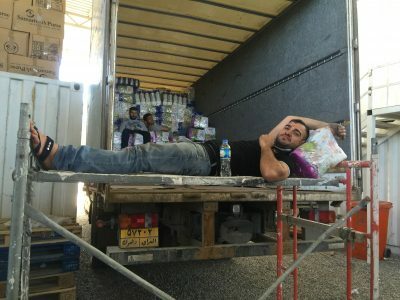 I wrote a column when I returned to the United States about the Kurds stopping our convey from reaching Qaraqosh. It was entitled “Iraqi Palace of Mirrors” and was widely published. It can still be found at WND.COM and other news outlets. 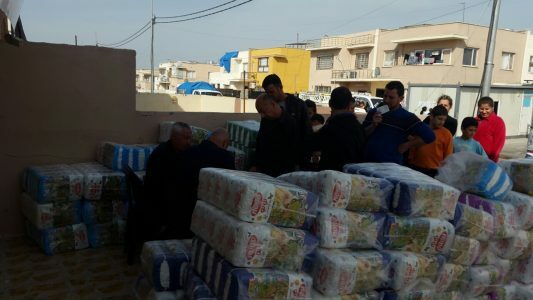 Since my first visit, I have returned to Qaraqosh several times most often to watch the delivery of diapers to the families who have moved back. The real name of the town is Baghdadi. Baghdadi was the Assyrian name before it was renamed by Muslim Arabs after their expansion out of what is now Saudi Arabia. 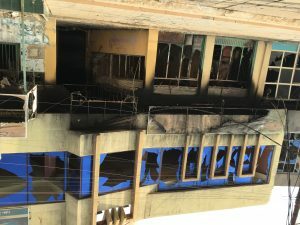 This photo of a business looted and burned out in Qaraqosh was taken by me in December 2016. While I was there, a Shia militia drove through town on their way to fight in Mosul, which was held by ISIS. As far as the Christians who live there are concerned, the name of the town is still Baghdadi. In June of this year, when I visited Baghdadi I was given a shirt with the ancient name of the town on it. The entire Nineveh Plain region was Assyrian Christian before the invasion by Muslims. It pretty much remained Christian despite persecution by Arabs and Kurds — until the American intervention in Iraq. Since that time, most Christians have been forced out. 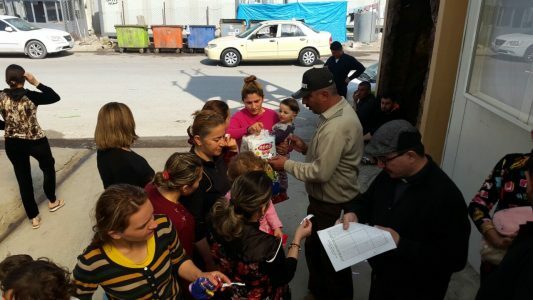 There were two million Christians in Iraq when the United States invaded in 2003. Today there are only about 200,000 Christians left and most of those would escape if they could. The few Christians who remain need our help. 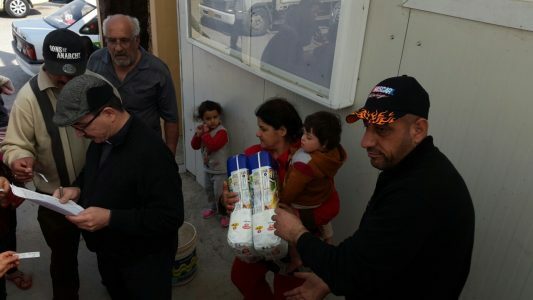 The Christians of the Nineveh Plain are returning to homes that at best have been looted and at worst completely destroyed. 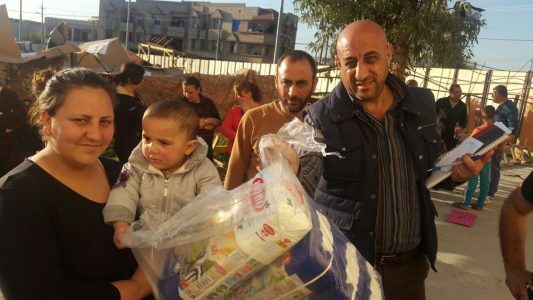 “The diaper ministry,” as we are called there, brings some sunshine to the bleak existence in the devastated towns of the Nineveh Plain. There is no cable TV, no high-speed Internet. There is not even any water pressure. Worse, the well water is as salty as the sea and drinking water must be trucked in. What water is available is too valuable to wash clothing with. 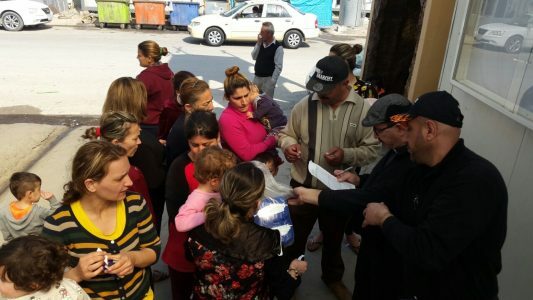 The Christians returning to the towns of the Nineveh Plain find few jobs and have the great expense of rebuilding their lives. Those with babies and toddlers cannot wash cloth diapers because of the water situation. All power is still only by generators as power lines are not up yet. The cost of disposable diapers is a real burden but one that keeps infants free of severe diaper rash infections. 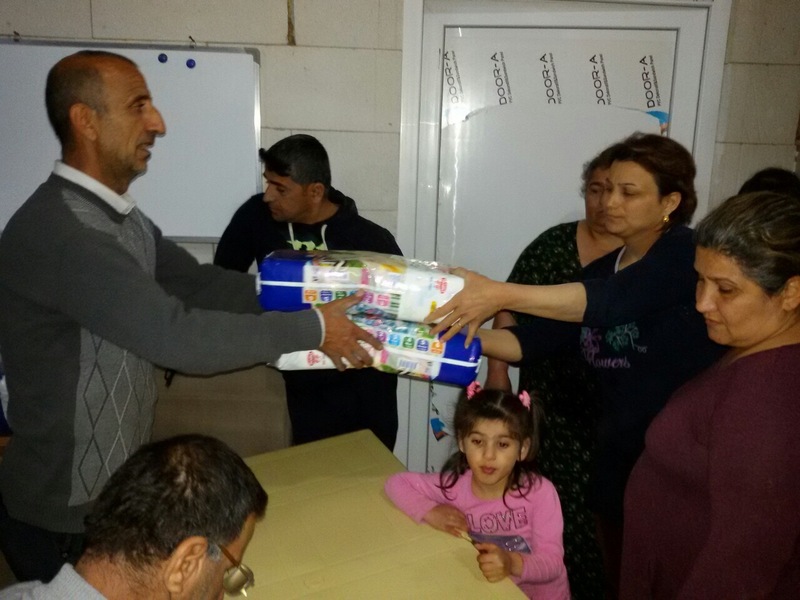 Our program removes that burden form these desperate families. We don’t stop there. 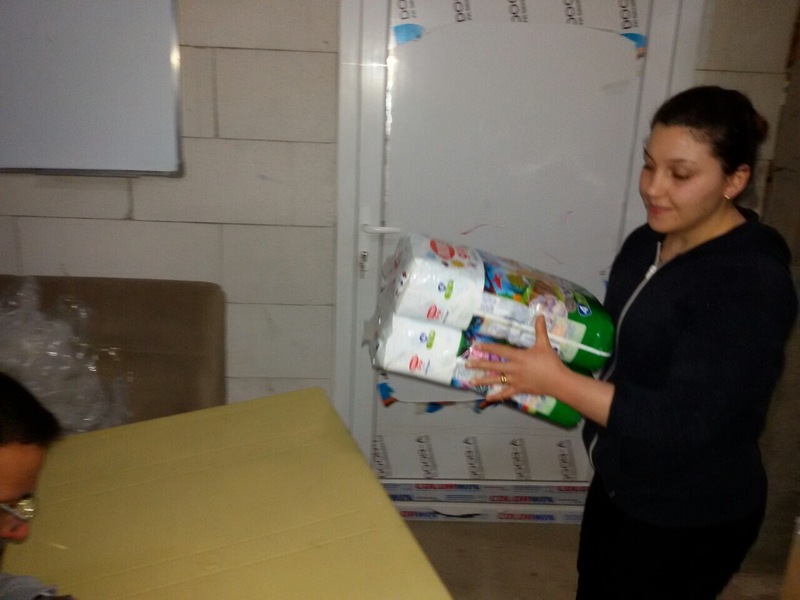 We also distribute adult diapers for elderly and handicapped who have special needs. 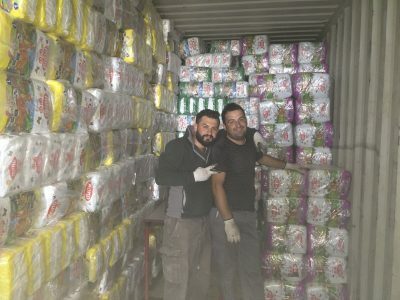 We transferred the funds for the September purchase of high-quality diapers made in Turkey and the diapers have been delivered to our associate ministry’s warehouse in Erbil and to a distribution facility in Qaraqosh (Baghdadi). 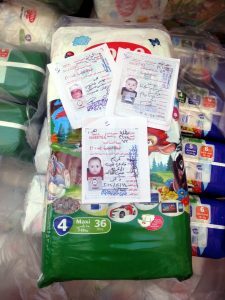 We require the official government ID of the infant or toddler to make sure diapers are used by those in need. The families are in great need and we work to make sure those in the greatest need are assisted. We work with pastors and priests of all denominations to obtain lists of those in the church who require diapers. Although the volunteers work off those lists to help distribute the diapers, we still require the ID of both the parent and the infant to make sure the diapers go to help those most in need. 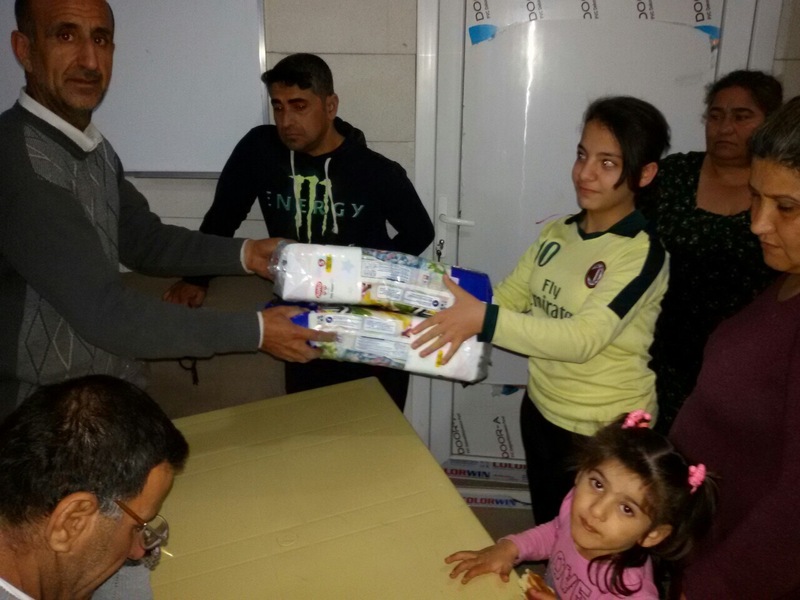 Our commitment to the Diapers for Refugees program in Iraq calls for a December distribution of an additional 500,000 diapers, along with sanitary pads and special needs adult diapers. 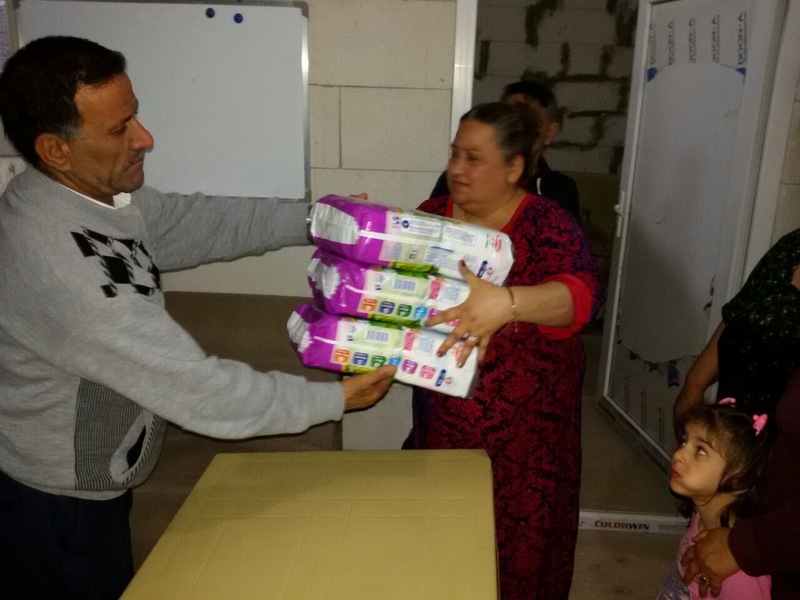 We are very close to achieving that goal at the same time we are ramping up for the Christmas programs in five nations including Syria. 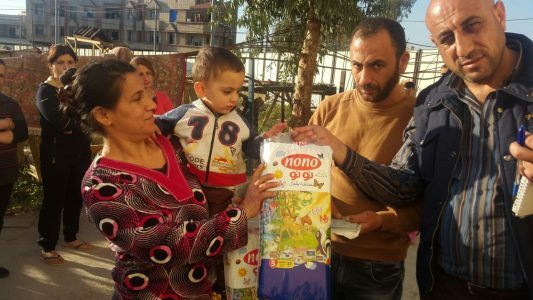 Please pray that whatever funds may still be needed for the Diapers for Refugees program will be raised quickly, allowing us to concentrate on providing Christmas events for thousands of displaced Middle East Christians. Please pray for the children and their parents, that their lives can reach some kind of peace in the middle of the chaos of the Middle East. 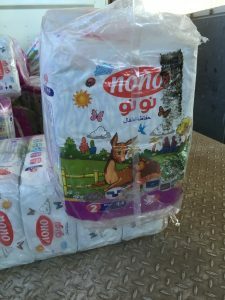 Our ministry partner in Jordan has called me several times, pleading for the Diapers for Refugees program to help Christians families there. The small pilot program he envisions would cost only $7,500, but I will not make a commitment until I am sure that every dime needed for the program in Iraq is available. 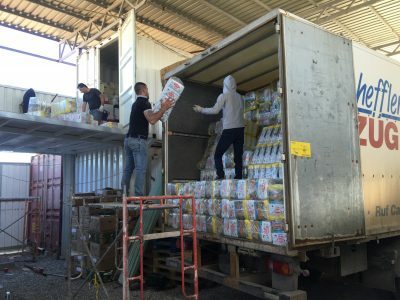 The commitment in Iraq was made for four distributions in 2018, and that promise must be kept. 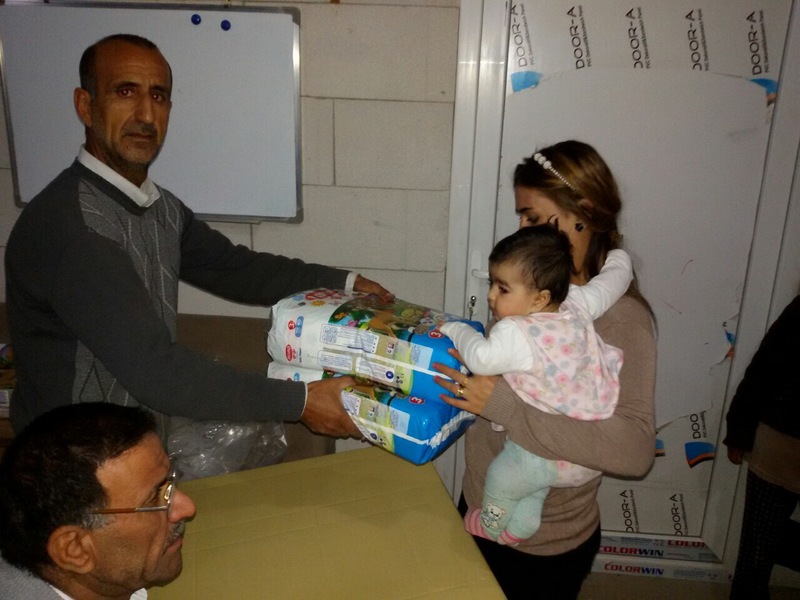 If current price of diapers stays the same we will distribute 500,000 again in December! 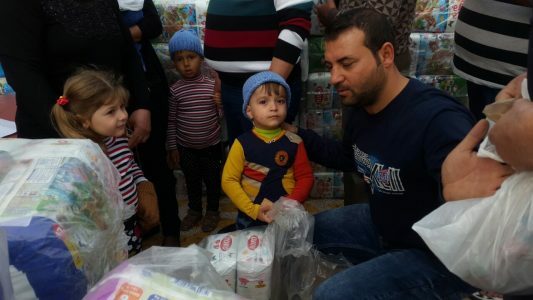 Doubling the Diaper Program in Iraq: Our recent poll of supporters currently gives the Diapers for Refugees program first place among our programs, but it is still number two overall. 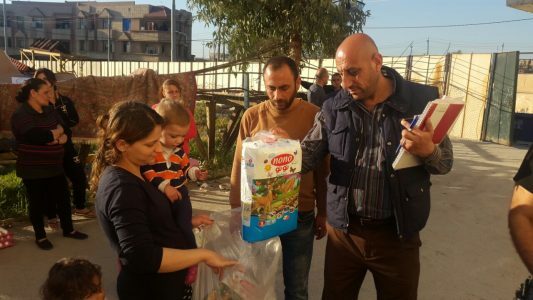 Most of those responding to the January poll so far have told me to “Do it all / Whichever you think is best” which includes Diapers for Refugees, Christmas for Refugees, the Nigeria Easter program and our advocacy programs on Capitol Hill. That is a tall order. 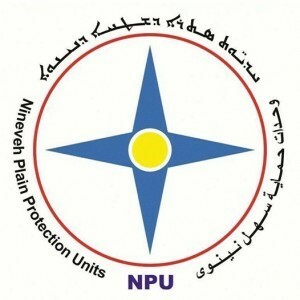 The current isolated status of the Kurdish region of northern Iraq where our mission on the Nineveh Plain is located makes the tall order even more complicated. 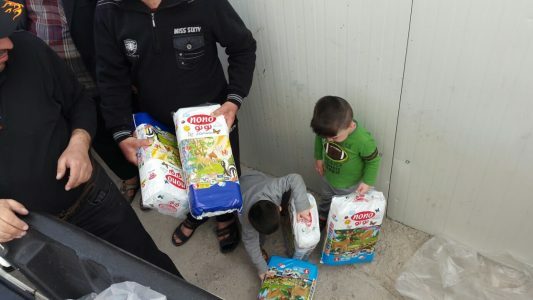 This year, I want more than anything to double our diaper program in Iraq. In December 2017 we managed to increase the program more than 10%, even though the cost of the diapers increased. 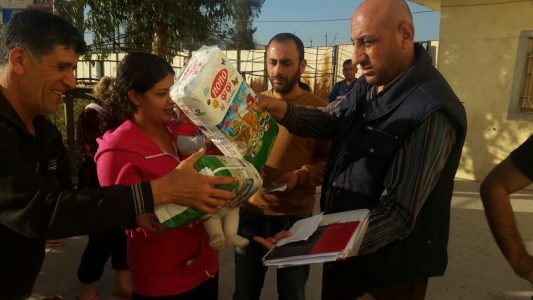 The December diaper program in Iraq cost $22,000 rather than the $18,000 cost in each previous quarter. 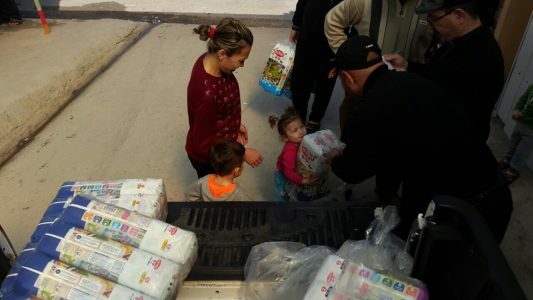 In the quarter ending in December, we delivered 180,000 diapers. In March we were able to increase the amount to 220,000 diapers at a cost of $24,950, bring us almost 40% towards doubling the program this year! Sanitary pads for 250 mothers will cost $230 and special needs diapers for 60 older people will cost $720. The grand total for March was $25,900. However, this significant increase was only made possible by one very generous supporter whom the Lord has blessed who donated $8,000 toward the March diaper delivery. I am worried we may not be able to maintain this growth for the June diaper delivery. Please pray that once again we will meet our goal in June of expanding the diaper program. 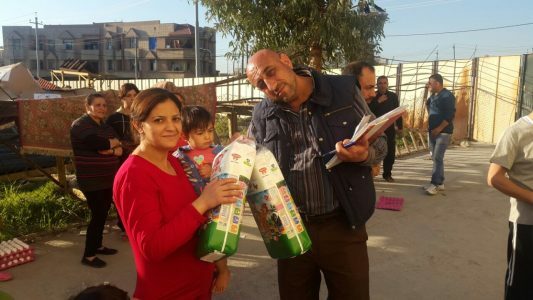 The need is so great for these refugee families! 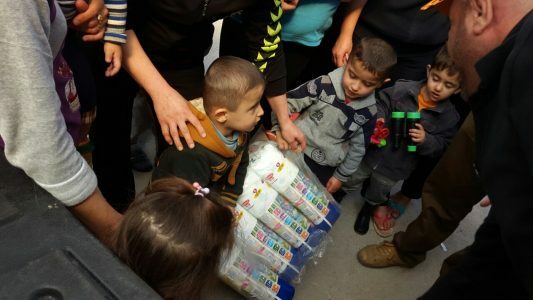 Mothers and children waiting in line for diapers. We are currently in our second diaper distribution of the year! 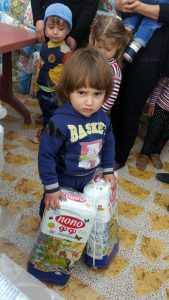 Our ministry partners in Iraq are continuing to roll out diapers from our first distribution. 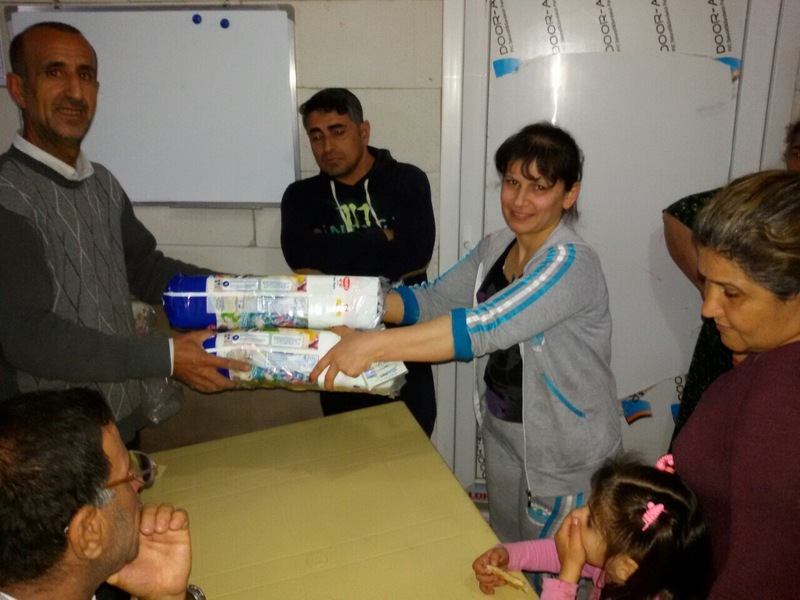 This month already, five more Christian refugee camps received diaper and sanitary pads. 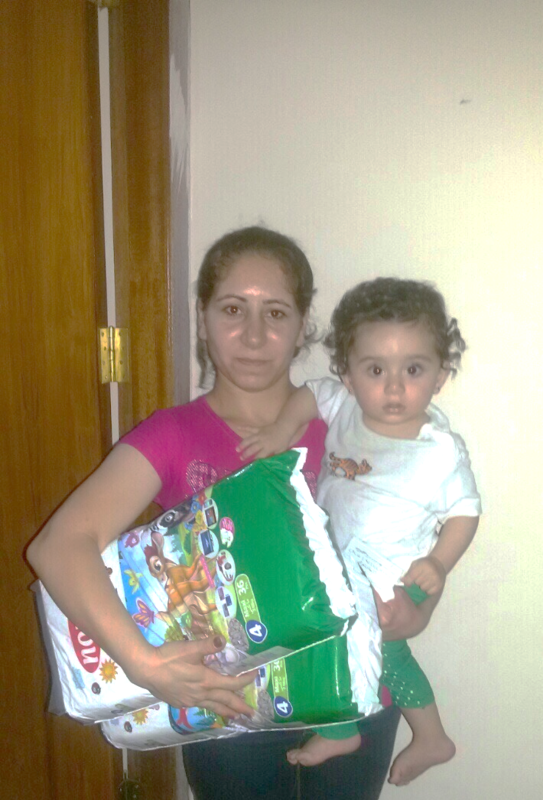 On June 16, 90 families received 2 packs of diapers per child, totaling 180 diaper packs distributed. 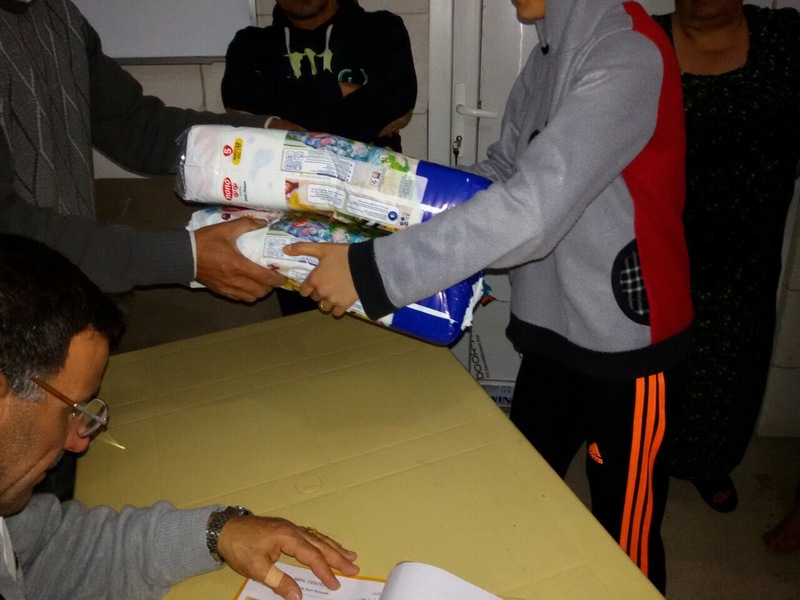 At this camp, 192 packs of female sanitary pads were delivered along with 12 packs of adult diapers. 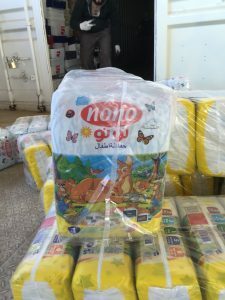 Later that day in another camp, 220 children each received two packs of diapers. 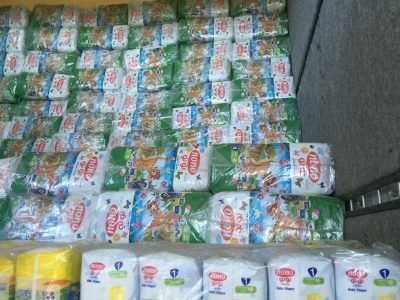 28 feminine sanitary pads were delivered as were 72 packs of adult diapers. 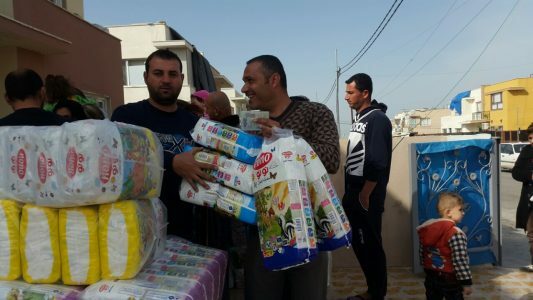 On June 16 in another area of Iraq, 55 Christian families in a refugee camp received two packs of diapers, totaling 110 packs. 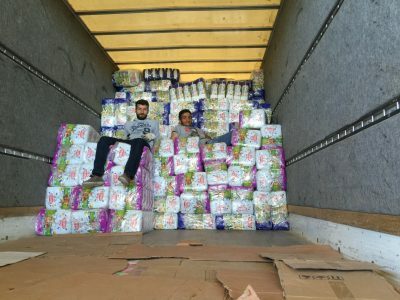 104 packs of women’s sanitary pads were delivered along with 24 packs of adult diapers. 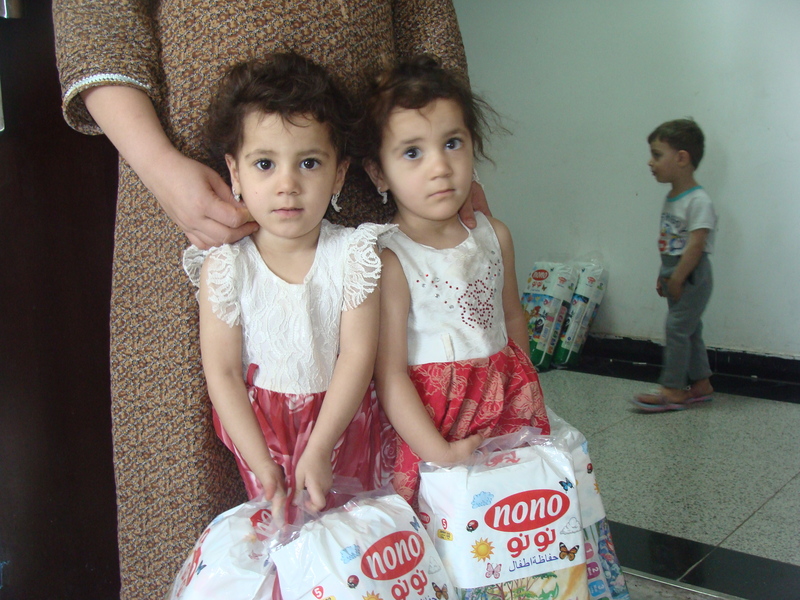 The next day, June 17, 660 packs of diapers were distributed to 330 children. 672 feminine sanitary pad packs were delivered and distributed and 24 packs of adult diapers were distributed as well. 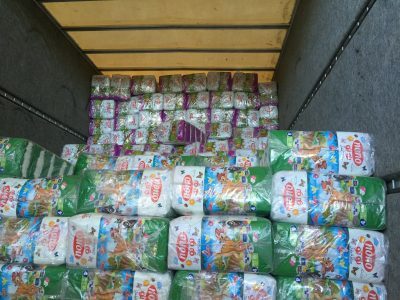 On June 18, 130 families received diapers for their children. Those in need of adult diapers received two packs each, totaling 12 packs. 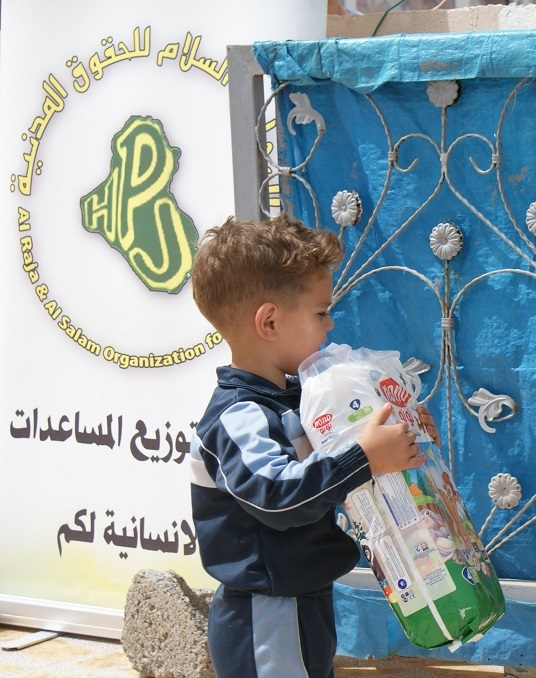 At this camp, 130 families received food packages, that contained 16 food items, and hygiene packages that contained 16 cleaning items. 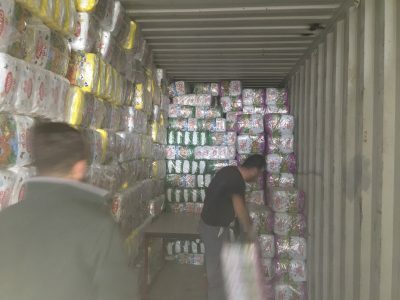 The Diapers for Refugees program is currently delivering 160,000 high quality disposable diapers to Christian families in northern Iraq every three months. 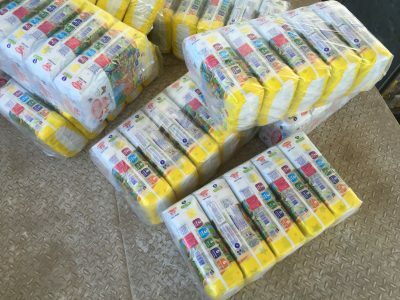 The cost of a single shipment of diapers is $18,000. This cost has remained stable since the start of the program in 2016. The cost per diaper is only 11 cents each. Please help us as we strive to reach out goal of 640,000 diapers delivered to Christian families in need in 2017. 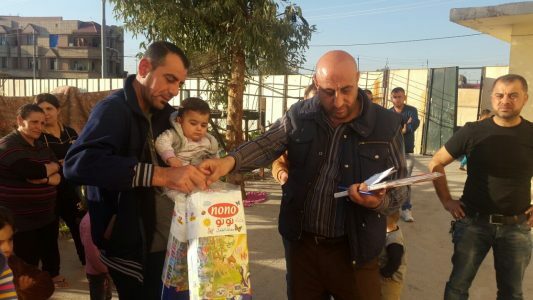 March kicked off the 2017 Diapers for Refugees delivery program in Iraq. 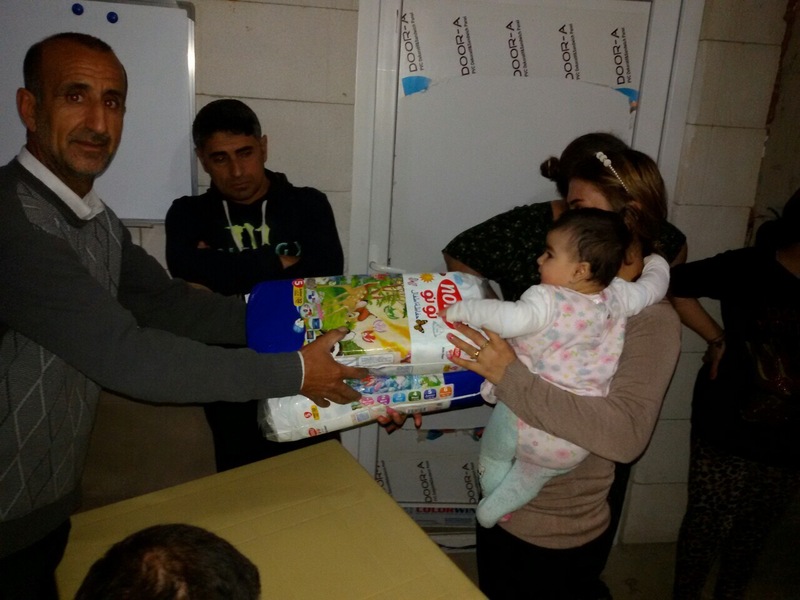 Our ministry partners in Iraq are continuing to roll out diapers from our first distribution. 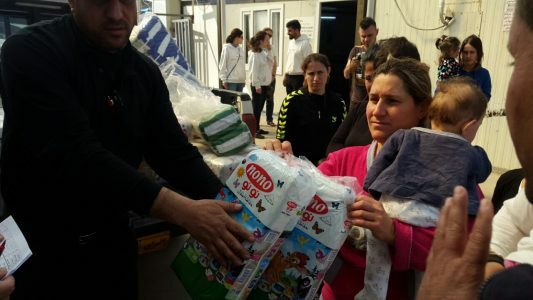 In May, four more Christian refugee camps received diaper and sanitary pads. 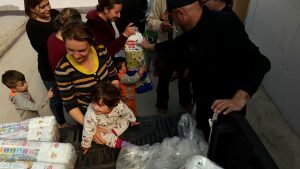 On May 1, 75 families received 2 packs of diapers, totaling 150 diaper packs distributed. 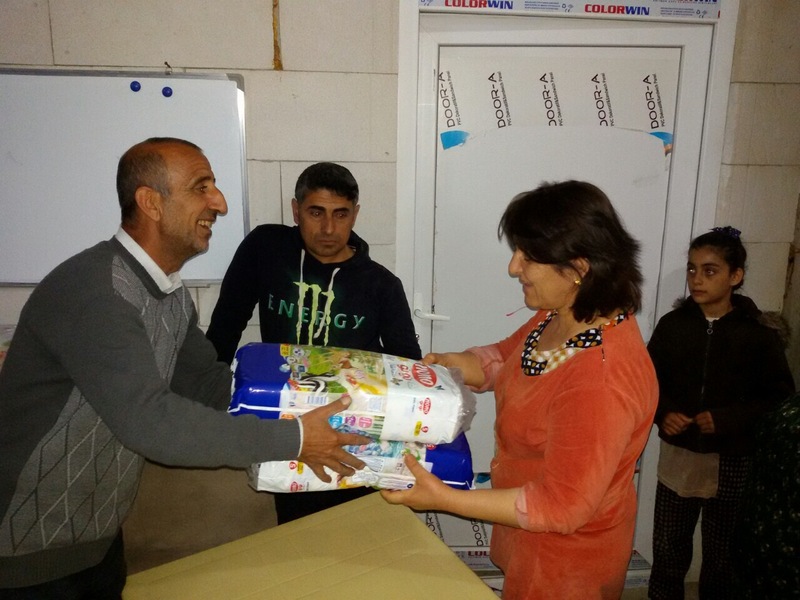 Later that day in another camp, 50 families each received two packs of diapers, totaling 100 packs delivered. 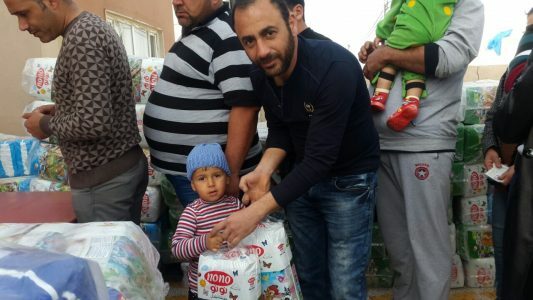 On May 4, 68 Christian families in a refugee camp received two packs of diapers. 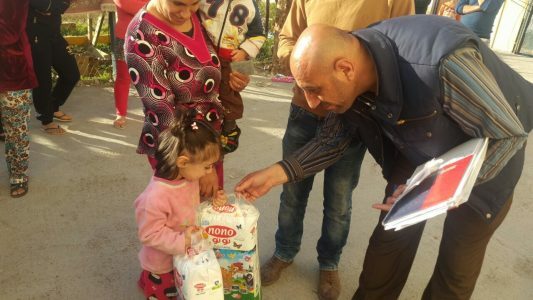 The largest distribution happened on May 13, when 430 packs of diapers were distributed to 215 Christian refugee families. At this camp, we were also able to provide 400 packs of sanitary pads to the women of the camp. 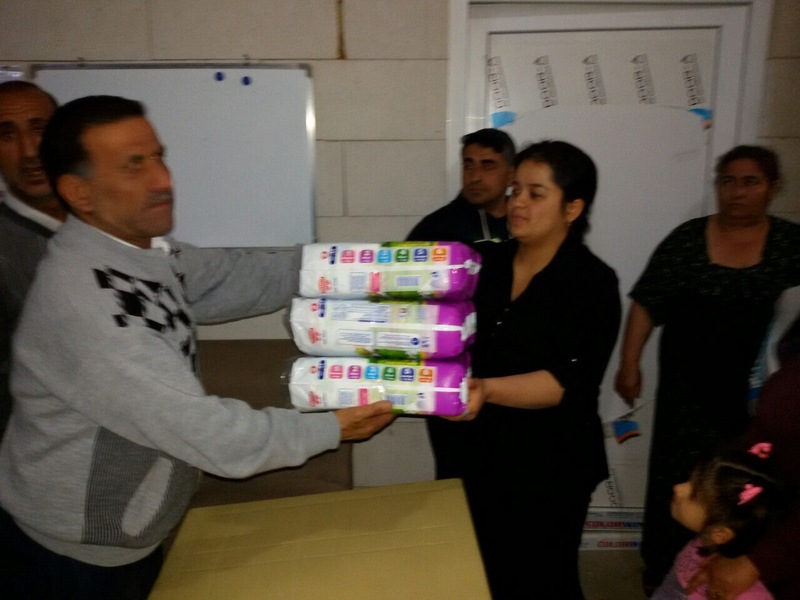 Each woman received two packs each. 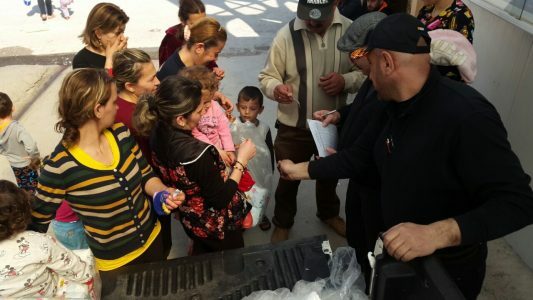 Last year, former Secretary of State Kerry declared that ISIS is committing genocide against Christians and other religious and ethnic minorities, however the Administration fell short on necessary follow through. Today, Rep. Chris Smith (NJ-04), Chairman of the House panel on global human rights, urged the new Trump Administration to step in and close the gap created by its predecessor. Smith, along with Rep. Sean Duffy (WI-07), Rep. Anna Eshoo (CA-18), Rep. Jeff Fortenberry (NE-01) and Senator Bill Cassidy (R-LA), today sent a bipartisan, bicameral letter to Secretary of State Rex Tillerson and U.S. Ambassador to the United Nations Nikki Haley, requesting an update on actions the U.S. has taken to investigate and hold accountable perpetrators, urging the U.S. to take the lead on related efforts at the U.N. and emphasizing the need to seek justice for all the victims, including Christians. Click Here to Read the Letter. Identify threats of persecution and other early warning indicators of genocide, crimes against humanity, or war crimes against Iraqi and Syrian religious or ethnic minorities that ISIS targeted for these crimes, or against other religious or ethnic minorities that are persecuted. 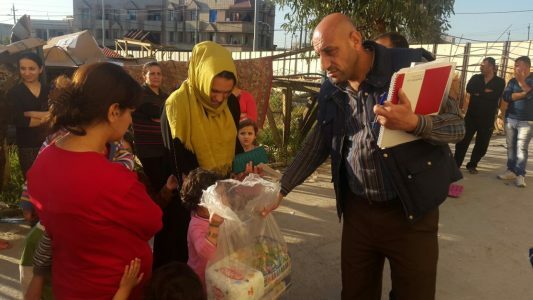 Provide humanitarian, stabilization, and recovery assistance to these communities, through entities that are effectively assisting them, including faith-based entities. Support criminal investigations of perpetrators of genocide, crimes against humanity, or war crimes in Iraq, specifically ones collecting evidence that can be used in criminal trials. Review U.S. relevant law and recommend how to close statutory gaps in being able to prosecute in the U.S. American citizens, or foreign nationals who come to the U.S., who have committed these crimes abroad. The legislation is supported by more than 20 groups, including the Knights of Columbus, Family Research Council, U.S. Conference of Catholic Bishops, Ethics & Religious Liberty Commission (Southern Baptist Convention), 21st Century Wilberforce Initiative, In Defense of Christians, ADF International, Baylor University, Open Doors, Chaldean Assyrian Syriac Business Alliance, A Demand for Action, Yezidi Human Rights Organization International, Religious Freedom Institute, Center for Religious Freedom (Hudson Institute), Christian Solidarity Worldwide, Community of Sant’Egidio, International Christian Concern and the Religious Freedom Coalition. It is also supported by all the former US Ambassadors-at Large for War Crimes, David Scheffer (1997-2001), Pierre Prosper (2001-2005), Clint Williamson (2006-2009) and Stephen Rapp (2009-2015), as well as the Founding Chief Prosecutor of the Special Court for Sierra Leone, David Crane; Director of the Center for Religious Freedom Nina Shea; and the author of Defying ISIS, Rev. Johnnie Moore. 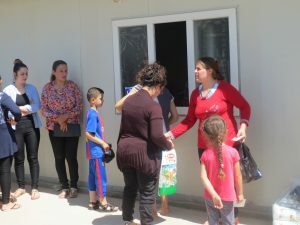 Smith has held nine related Congressional hearings since 2013 and last December led a mission to Erbil (Kurdistan Region of Iraq) at the invitation of the Chaldean Catholic Archbishop of Erbil, Bashar Warda, to see first-hand the plight of the 70,000 Christians – almost 1/3 of Christians remaining in Iraq – who escaped ISIS and have been sustained by the Archdiocese of Erbil with support from organizations like the Knights of Columbus and without any support so far from the U.S..